As some of you will know, I've been showing off my new Christmas soaps on Facebook. The last post showed you our Very Merry Berry which has been a huge hit with almost half the batch now on pre-order lists! Today I'm featuring Winters Day - this is a polar white and ice blue soap, made with our own blend of Sweet Almond, Golden Olive and Avocado Oils with lashings of creamy Cocoa Butter. It's coloured with titanium dioxide for the white and a small amount of pearl blue mica. It's all dusted with an icy glisten of cosmetic glitter. The fragrance is described as a crisp Winter blend of mild Menthol, Pine, Spruce, Eucalyptus, Lavender & Cedarwood ... it's a really lovely fragrance, clean and clear. With the menthol and eucalyptus, I thought it might smell somewhat like a flu fighter but nope, it's smoothe and fresh and just so lovely. So, for your viewing pleasure, here is our Winters Day soap - it will be fully cured by mid November and on the site then. 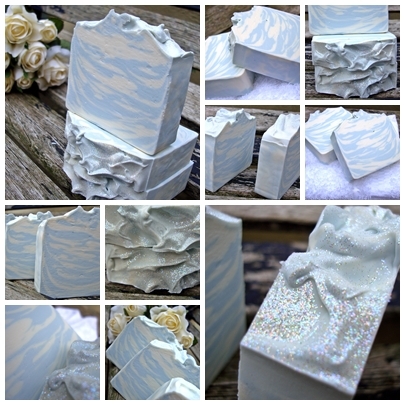 Really hope you like this soap - drop me a line if you have any comments or queries and don't forget to check out our new website at http://www.iamhandmade.com/. Very nice and "winterly". I did never try a fragrance with eucalyptus. Perhaps I should give it a try. Wonderful looking soap Celine, I love it! Gorgeous for winter holidays and the fragrance sounds fantastic, like being in the woods in the snow. Love it!